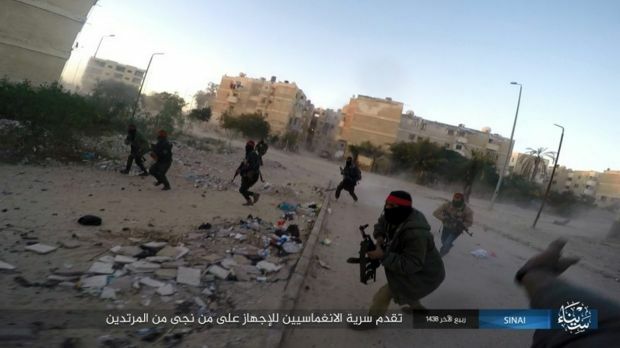 Unconfirmed reports and social media accounts in both Egypt and Palestine have indicated that three members of the Hamas Islamist movement were involved in the Islamic State group (IS)-linked attacks, which killed 23 Egyptian soldiers Friday in the Sinai, Asharq al-Awsat reports. If confirmed, Hamas, which has been working tirelessly to improve ties with Cairo, will be under tight pressure. Speculations of the involvement of the Hamas members in the Friday attack emerged after the Egyptian army shared videos of alleged killed attackers. Among the killed attackers exhibited were three persons from Rafah, southern Gaza. The men are believed members of al-Qassam brigades, an armed wing of Hamas. According to the Egyptian army, the men were recognized by their families. There has been no comment from both Hamas and Cairo over the reports, Asharq al-Awsat notes. Hamas Friday condemned the attack on the Egyptian security personnel. Fawzi Barhoum, spokesman of the movement qualified the attack as “a criminal, a terrorist, and a coward attack” that doesn’t target Egypt only, but the security and stability of the entire Arab nation. The incident takes place as ties between Hamas and Cairo have just started warming up. Movement leader Ismail Haniya, last week, confirmed that Egyptian authorities issued a package of measures to help loose the grip around Gaza under Israeli blockade for over a decade. Cairo last month accepted to ease restrictions on Hamas, allowing movement flow between Egypt and Gaza at the Rafah crossing and providing aid to alleviate the humanitarian disasters feared in the Strip after Israel decided to scale down its power supply. Cairo has already supplied Gaza’s only power plant with million liters (264,200 gallons) of fuel, enough to supply power for few days. Cairo had accused Hamas of hiding terrorists supporting militant groups in Sinai opposed to President al-Sisi who toppled Islamist President Mohamed Morsi in 2013. Written by: KanelkaTagba on July 10, 2017. Posted by KanelkaTagba on Jul 10 2017. Filed under Headlines, World News. You can follow any responses to this entry through the RSS 2.0. Both comments and pings are currently closed.